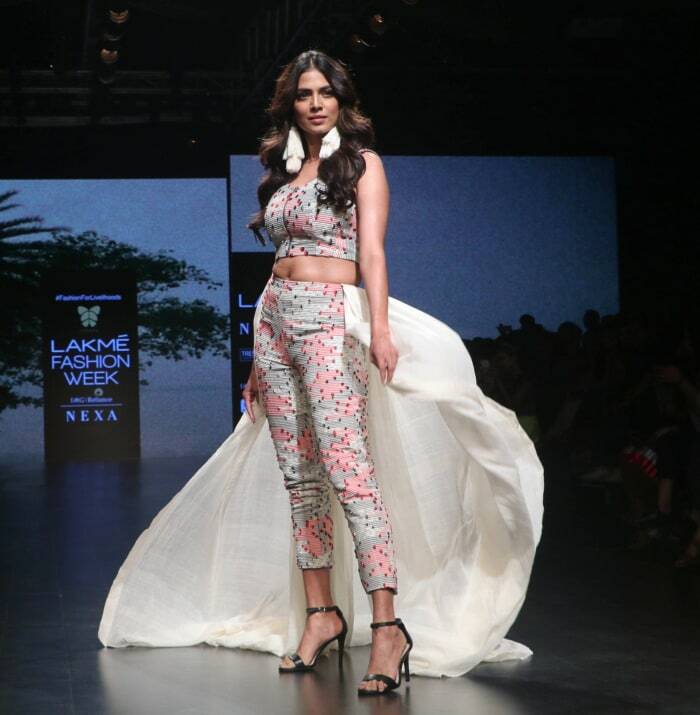 For designer Jyoti Reddy’s collection showcase at Lakme Fashion Week, Bollywood actress Malavika Mohanan walked the runway as a showstopper. Her look comprised of a co-ord set with a cape, strap sandals and oversized tassel earrings. Adding life to her look was a voluminous curled hairstyle, full of gloss and bounce. It’s safe to say that it was the standout feature of Malavika’s beauty look so if you’d like to try it at home, follow our steps. Step 1 – Brush your hair out completely with Roots Star Glam Paddle Brush costing Rs 320, reduced from Rs 425. You don’t want any knots or tangles now, do you? Step 2 – Follow this by spritzing the length of your hair with Schwarzkopf Gliss Total Repair Heat Protection Spray costing Rs 449, reduced from Rs 550 to protect your hair from damage while heat styling it. Once done, part it down the centre. Step 3 – Then keep your Silvino Triple Barrel Hair Curler costing Rs 1,699, reduced from Rs 3,999 to heat for a few minutes. It is a good choice as it has three barrels to form the large, cascading curls Malavika is sporting. Divide all your hair into 3-inch sections and for each section, wrap it around the barrel with the ends, hold it for a few second and slowly slide the curler downward out of the hair. Repeat this process for each section until all hair has been curled. Step 4 – Use the hair brush to gently brush through the curls, which will open them out and add more volume. Step 5 – Finish the hairstyle by spraying it with Schwarzkopf Taft Hair Shine Lacquer costing Rs 310, reduced from Rs 395 to lend shine and keep the curls in place. Will you try this hairstyle seen on Malavika Mohanan? Tell us in the comments.